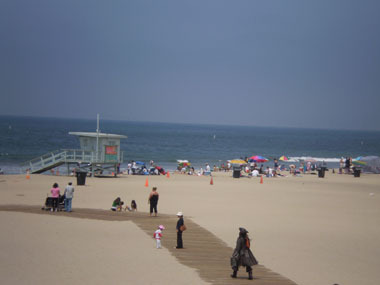 The first place to visit this morning is Santa Monica beach, which it will easy if we’ve arrived there the previous night but, if we don’t, then the first thing to do is driving to there. 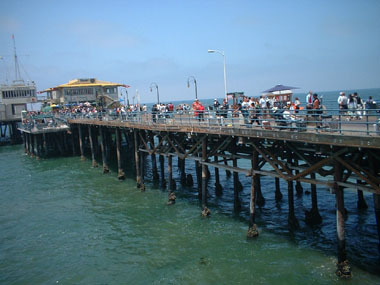 Then we will walk around that beach famous by their skaters, the pier and the “Baywatch” stuff. This is the best chance of get into the Pacific Ocean. We must find Muscle Beach too, the special opened gym area in this beach where Arnold Swartzenegger, among others, used to get his muscles. I haven’t located it yet, though. 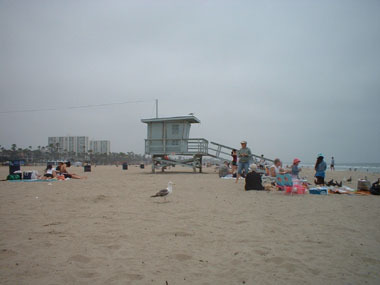 Then we go to the next beach at South: Venice Beach, famous by their policemen riding a bike in shorts as shown in “Pacific blue” TV series. We must leave the beach at noon to be at hotel, in Hollywood, by lunch time. 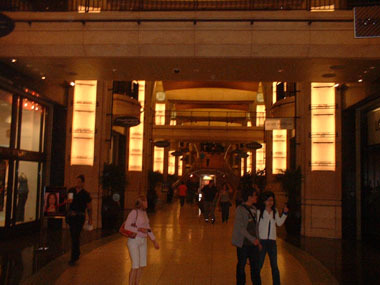 The afternoon is planned for spending it in Hollywood Boulevard, when we will visit the Hall of fame and Chinese theater. We can have time ti spend in Rodeo Drive and Sunset Boulevard as well. An itinerary around Beverly Hills could be made too if it is suitable in our time. We don’t need to wake up early so we rest and take our breakfast with no rushes. Then we check out and take the car to go to the beach. What we have around is small houses with their garden. Our way is just driving down Pico Boulevard until reaching the beach. Just after reaching it we can see the parking signs which drive us to an open parking lot just before the sand. 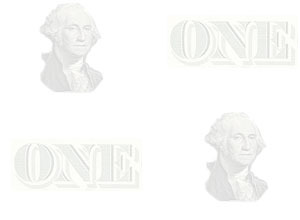 It is 6$ for one whole day, but it is a unique fee, so 10 minutes is 6$ too. 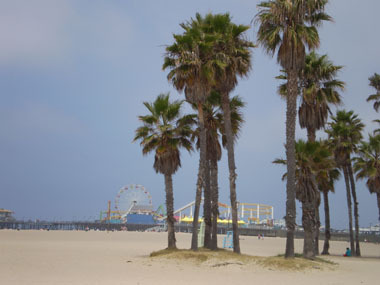 It’s 11:30h when we’re leaving the car and watching the vast beach with main shape of the pier at North, with an amusement park upon it, and several palm trees around. The light and fine sand is what you can see most as the strand can make easily 200 meters until the sea itself. 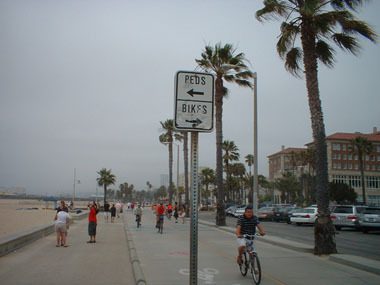 In the promenade above, there are two ways: one for pedestrians and the other one for bikes. The wide strand has an asphalted way sneaking across it: it is the one used by the famous skaters of this beach, but today, as we’re walking by it to the pier, is used more by runners and cyclists. In our way, we can enjoy the palm trees closer and the lifeguard towers still far. When we’re reaching the pier this path exchanges the asphalt by planks. I guess it is because it matches statically with the pier itself, which is built in wood and suspended over the trunks coming from the sand at the beginning, and from the sea further. There is a lot of life up in the pier. 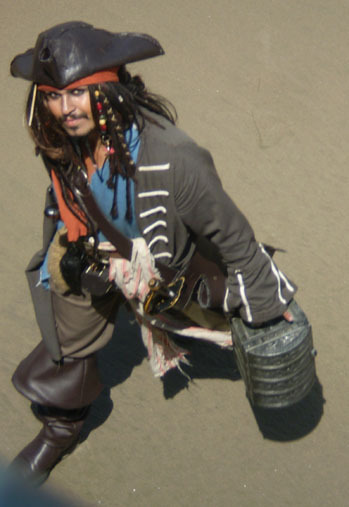 I go to the toilet, meet Jack Sparrow in there and do “my thing”… Wait! Was that Jack Sparrow?! I go outside trying to locating him as it is the best portrayal ever. Even the face was like Johnny Deep’s! I ask to the women but they haven’t seen any pirate around. When I’m trying to explain the similarity I realize how difficult is showing to them by words, so I start looking around for him until I finally find him, but he is not in the pier anymore, but walking by the beach with a chest in the hand and the manners of the well-known pirate. I can see how he is offering for a picture with him and, once paid, he lets people take something inside his chest. The picture at right shows him walking by the beach. He is getting further so I cannot get a good photo but, just when I’m thinking about moving on to other things he turns and walks to the pier, getting closer and closer. It’s just when he was going to disappear under the pier when we get our picture when he even is looking to the camera. Thanks. We’re happy now, but still a lot of things to see in front of us, so we explore the pier, which is like a small amusement park. Eva and I go for a ride on the roller coaster: 5$ each. It is small but quite impressive and the main advantage of it, the localization, only can be enjoyed at the very beginning, then you get into the hustle and bustle where you cannot think about the landscape at all. This is a perfect day for beach so, following our plan, we go down the pier for one stop before taking the car for exploring Venice Beach: we are not leaving this place without “tasting” the Pacific waters. We take the towels and trunks out the trunk and go into the sand. My mission of swimming and diving in this ocean is aborted at the very moment my feet can feel the water: it is so cold that I’m already leaving the ocean… well… just after the photo. My sister wants her picture in the water too and my wife doesn’t want even that. What a crap experience in the biggest Ocean! We go now quick to the car as it is almost lunch time and we still have to visit Venice Beach before going to our hotel in Hollywood. But while removing the sand from us I remember we haven’t seen the Muscle Beach at all, so I leave the women while going to find it with my map just to take a picture. I find it in a corner, when the sand ends: it is just a small area of grass with some gym stuff. No wonder why have we missed it. I’m coming back to the car when I can see two policemen in shorts and bicycles. Just what I was expecting to find in Venice Beach! Venice Beach is just beside Santa Monica but one can notice the change around: big fancy houses by small houses with an opened garage… surfer atmosphere… more liberal…. We cannot find parking place and we can use that as an excuse for going to the hotel. We’re back to the highways maze they have got in this city and drive around, quite lost, for a while. 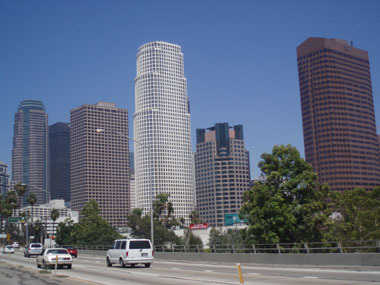 It is positive this time, as we can have a closer look of downtown, with the skyscrapers and even the Staples Center, where tomorrow the Lakers are going to play the fourth match of NBA finals. I’ve been looking for a way to watch it, but no results yet. We finally find a sign addressing to Hollywood and follow it to take the right highway. We are amazed when seeing, in a specific point of the highway change, five levels of roads!, one above the next. 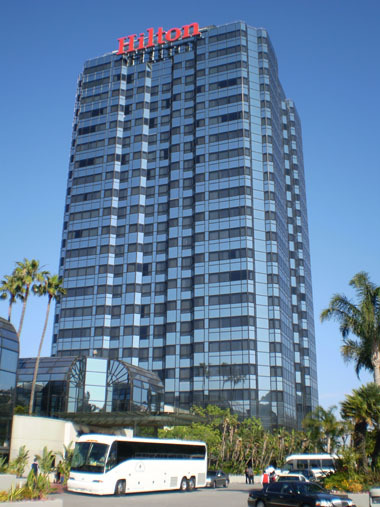 We can reach Universal City easily once in the right way as the signs are pointing to it from the highway so, following them, we end in the Hilton Universal Hotel’s valet, who is taking our car. The picture below at right shows the views from our room. 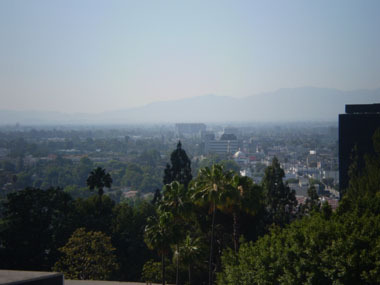 Los Angeles is such a huge city that you can see it as a forest with houses here and there till the horizon more than the typical group of buildings, from Hollywood hill, at least. The hotel is amazing as the views of the buffet they’re getting ready in the restaurant, with mountains of seafood, and different kinds of crabs – huge crabs - among them. It is not the regular menu, but a special one because of Father’s day. It’s 60$ per person, which is expensive, but we can afford 40€ for joining such gastronomic paradise. We obviously taste every single kind of crab and other animals from the sea. We use pincers to eat the crab pincers and legs, which there are of all kinds: long, short, big, small… We’re enjoying this time as per Trini being worried about having time to visiting Hollywood as we’re spending a lot here. I check the map and discard going to three spots: Rodeo Drive – because it is just a street with very expensive shops in which Eva will want to spend hours -, Beverly Hills – because the celebrity houses are securely guarded by tall walls and doors so, at the end of the day, we just get pictures of railing doors – and Sunset Boulevard – because we’re going to arrive at dark, when it is the street of the prostitutes and the preachers… well, we can still get a moment for that -. 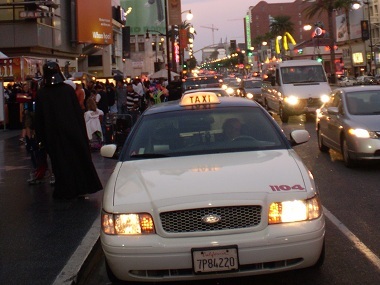 With this, we can spend the evening in Hollywood Boulevard, which is a clear must-do and feasible. The way to reach it seems simple: you just have to drive down until Mulholland Drive entrance at right and this famous road takes you almost to the Boulevard itself. We do that, at the beginning we can see a vista point we don't have time to explore, and drive down the hill through expensive houses and a lot of curves until getting into something looking more like a city, and then the parking signs drive us to a place to leave the car in a shopping mall. This is not a big mall, but we’re going to find out this shopping mall is the center of everything here. 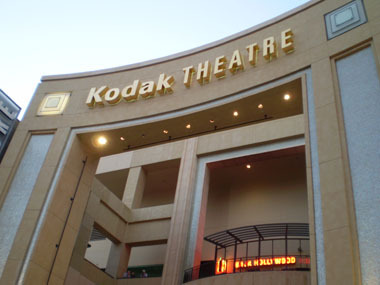 When we reach the street level I can see two door of glass with a vase between them and the letters above saying “Kodak Theater”. I can’t believe it is this, but it seems it is. When we go out to the street we realize we already are in the Hall of fame – easy because of the stars in the floor -. This is not such a broad street, so we’re trying to figure out where the red carpet is set when the Oscars. The only explanation is the whole street is “red-carpeted” because otherwise there is not space enough. We walk down reading the names in the stars. It doesn’t seem to have a sense in the order: there are mythical names as Ingrid Bergman beside Jackie Chan or people working on cinema we don’t recognize as celebrity. If one comes here with the thought of getting a picture with the star of a specific celebrity can spend the whole day here looking for it. We can see funny places, as the Wax Museum in our side, or the old fancy cinema of the picture across the street. Later on, and due to the impending dusk, we can see a lot of lights in this street, neon lights. One of them is pointing to a bricked building across the street with the word “Scientology” in green big characters. I must be the head office, here in the middle of Hollywood Boulevard. As we can see the street is becoming “less touristic” I ask to a policeman about Chinese theater and it results we’re walking in the opposite direction. That’s weird! As I don’t use to take the wrong way… never… buff. So we turn round and get to the shopping mall again. We can see the elephants upon high pillars we can reckon from watching the Oscars show on TV. 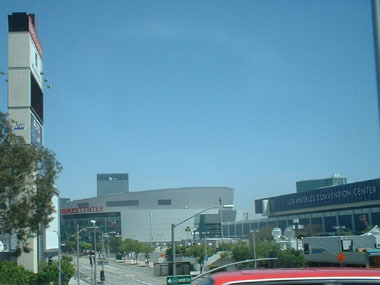 And then we can find the Chinese theater, just beside Kodak Theater, only the other side. The Boulevard seems to end close the theater, that’s the reason we walked on the opposite direction, but the Chinese theater and the celebrity footprints are in an opened area deeper from the buildings line, so it cannot be detected from that line. But there is something easier to find it, the X marking the spot is dozens of people dressed as movie characters looking for tourists paying for a picture with them and who cannot be unnoticed. There are an enormous variety of characters: Darth Vader, Iron Man, Batman, Charles Chaplin, Marilyn Monroe, … and a big etc, with some characters I cannot even reckon among them. I must talk here about the quality of these costumes in some cases: outrageous. If you’re wearing a cardboard box painted in red and say “I’m Ironman” is for making me laugh and it’s not for charging me for a photo. Another example, there is a guy trying to be reckoned as Jack Sparrow, but just because is wearing boots and is handling a plastic little sword. It’s not that you cannot compare him with the one from this morning in Santa Monica beach, this is losing even with my nephew with a regular pirate costume! As I want to be fair I must say some of them are quite fine. Somehow, when I’m trying to avoid laughing of some of these people I find my wife talking to the one is saying is Catwoman. “Take a picture of us” says to me, “She’s really nice”. I try to explain those people are here for making money, our money! But she answers: “No way, we’re friends now!”. So I resign to take the picture and closing the deal by a couple of dollars. I expected having to pay more, but it is still expensive by a picture of my wife with someone looking as a gay discotheque go-go. We watch the celebrity footprints on ground one by one. Comparing your hand or feet with the ones from a celebrity is kind of silly and funny at a time. On the picture, for example, there are (from left to right and up to down) Richard Gere, Johnny Depp, Michael Douglas and Al Pacino. The time range is as long as since Harold Lloyd to mentioned Johnny Depp. The prints are quite dirty and worn out from so many people using them, but none as the ones from Marilyn Monroe, practically black. Once we finish with Chinese theater we come back to Kodak Theater entrance to see what the actors see after red carpet: a hall driving to the theater entrance between columns with the names of the Best movie Oscar winners under each of the year numbers, six per column, which are the lights in the photo above. This pass way ends at the entrance we could see just after leaving the car. We take the car back to return to the hotel and finish our journey. We feel kind of disappointed as from TV everything of this place seems more majestic and big and we couldn’t think the place was as mundane as it is. That’s the magic. We take Mulholland Drive again, but this time we stop at the vista point we missed before. It is dark night now and there are a couple of cars in this viewpoint to the lights of the city. There is no lights here and is really dark, this may help to the couple in one of the cars, which don’t seem to be here because of the views. We can hear some voices and then we remember horror movies. We’re in the darkest spot of L.A., but quite safe, as everybody knows the first to be killed in a horror movie would be precisely the couple in the car. The voices belong to a group of tourists coming from somewhere upstairs. We’re not going to go up there as we cannot even see the stairs and the views cannot be better than the ones we have now in front of us: a vast and black sea of lights. It is a quiet place, in contrast with its role of balcony over the madness of one of the biggest cities in the world. There is some l9ghts below, the nearest ones, from where is coming some music. It could be a concert, but it is so far as per knowing anything about it. 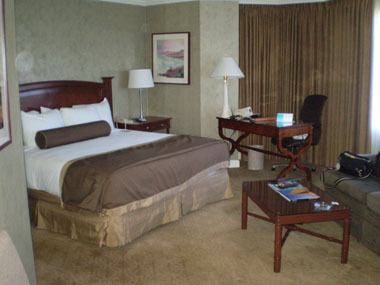 This has been a big day and the confortable bed of the Hilton is going to help us to be ready for an even bigger day tomorrow. But before, we eat the tacos we brought from San Luis Obispo yesterday in the room as dinner. It’s enough with the big lunch of toady and it helps to compensate for the expense.